Carefully loosen the skin of the chicken by lifting it from the flesh with your fingers. Mix the ricotta, sundried tomatoes and olives, and carefully stuff it underneath the skin. Rub the entire chicken with this marinade, and season with salt and pepper. Place the chicken in a kettle braai over medium coals and cover with lid, or place in a 180ºc oven, and roast for about 45-60 minutes. Mix herbs, capers, anchovies and garlic to a paste in a food processor or with a mortar and pestle. Add the lemon juice and olive oil, stir through well, add the onion, then season to taste. 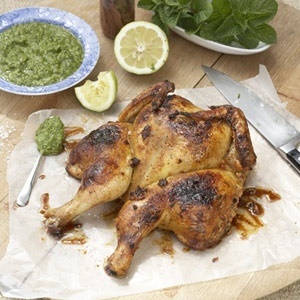 Serve the salsa verde with the roast chicken.